Off the A74 in Gretna Green, Hazeldene Hotel offers accommodation with free parking and WiFi. Just across the England/ Scotland border, this hotel also has a restaurant serving home-cooked meals featuring the region’s produce. Each room has a TV, desk, trouser press and tea and coffee facilities. All have an en suite bathroom with bath, shower, hairdryer and toiletries. Off the A74 in Gretna Green, Hazeldene Hotel offers accommodation with free parking and WiFi. Just across the England/ Scotland border, this hotel also has a restaurant serving home-cooked meals featuring the region’s produce. Each room has a TV, desk, trouser press and tea and coffee facilities. All have an en suite bathroom with bath, shower, hairdryer and toiletries. Breakfast is served each morning at Hazeldene Hotel. The restaurant menu includes a range of steaks and homemade burgers, traditional Scottish pies, black pudding and haggis, and tempting desserts including apple crumble and chocolate fudge cake. A selection of world wines and champagne are also offered. Gretna Green is just over 10 miles from Carlisle and the Solway Coast Area of Outstanding Natural Beauty also lies to the south. The famous Old Blacksmith’s Shop, where couples can marry over the anvil, is just a 1-minute walk from Hazeldene Hotel. 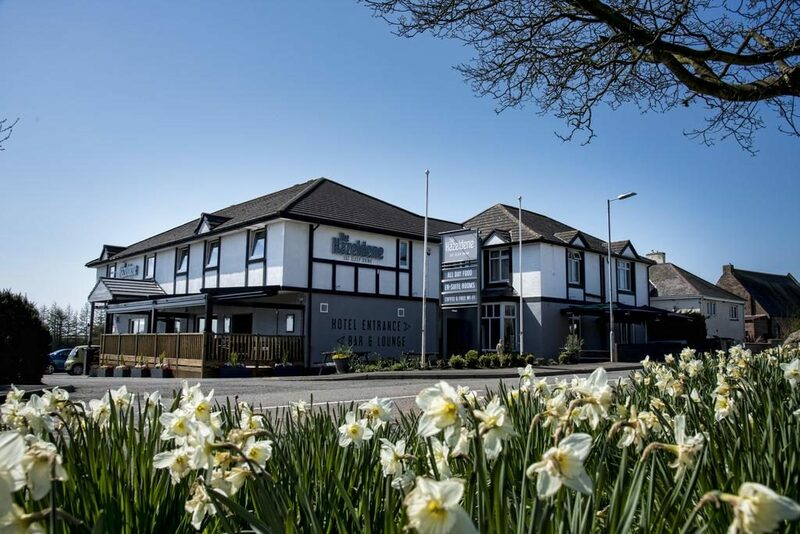 The Hazeldene is a small locally run hotel which has eleven en suite bedrooms, a large spacious lounge/restaurant, which seats up to 80, a fully enclosed or open decking area which seats up to 36 and a large well stocked bar based in the UK's Wedding Capital Gretna Green. We take great pride in what we are good at; namely being a 2/3 star hotel which offers clean modern contemporary accommodation. We serve good home cooked food, at affordable prices in our spacious and welcoming restaurant and our adjoining spacious bar area which has a pool table, darts boards and juke box. ​Our decking area is extremely popular with visiting wedding couples and their guests, we offer 3 private dining areas and an extensive selection of menu’s. (Reservations and Pre-Orders for larger parties are a must). If you are looking for a four or five star Restaurant, that’s not what we are, we are the chosen venue amongst the local clientele for many events such as dining with family or friends for birthdays, anniversaries or simply Breakfast, Lunch or Dinner. We are ideally situated in the heart of Gretna Green, only a 1 minute walk from The World Famous Blacksmiths, a 5 minute walk to The Gretna Hall Historic Marriage Venue, and only a 5 minute drive to The Mill Forge or The Anvil Hall. ​Throughout this website, you will find information which may interest you, for more detailed information please contact us by telephone or email from 9am - 9pm daily. Larger parties and coaches are welcome, but are advised to book in advance to avoid disappointment.IIf you wish to come along and view our rooms, sample our home cooked food or simply to have a look around, please do not hesitate to contact us. Hello, Welcome to The Hazeldene and thank you for your interest. We are a small localy run business with an 11 bedroom hotel in the wedding capital of the UK; Gretna Green. There are of course B&B’s and Guest Houses in Gretna Green but there are only 3 actual hotels; the difference being, a hotel offers food, restaurant and a bar. The Hazeldene offers a home from home feel and our locals continually get a mention on TripAdvisor for their welcome and friendliness. We take great pride in what we are good at; namely being a hotel which serves good home cooked food at a reasonable cost, with a well priced bar. Our Wedding Packages include specially selected 'wedding suppliers' who, from personal experience, we know are good, unlike many other hotels and accommodation venues, we do not accept commission from these suppliers. We merely ask them to offer their services at the best price for Hazeldene customers. Being a small, dedicated team, we will ensure you receive our personal attention on any planning issues, advice or other queries you may have.